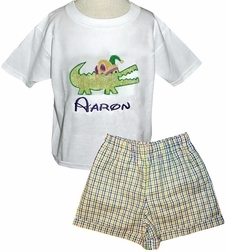 We love Mardi Gras and here is our custom Mardi Gras jester alligator John John, shirt or shirt and shorts outfit for little boys! It's that time of the year when the air is cool, sweet and full of candy! Yep, Mardi Gras parades-lots and lots of them. When you live in Mobile (where Mardi Gras in America was first celebrated by the way), you can't wait until you catch a glimpse of all of those colorful floats, costumes and ladies ball gowns. The traditional colors of Mardi Gras are of course yellow, purple and green. 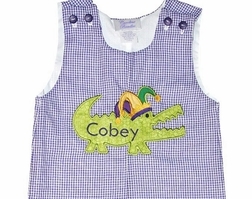 Using this famous color scheme we take purple gingham and make it into a John John or pair a white shirt with tri check Mardi Gras colored gingham shorts and applique the front of the John John or the shirt. 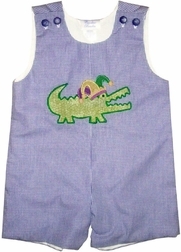 The applique is either a fun loving, partying alligator or crawfish from down south, particularly New Orleans! They come from the bayou to celebrate with your little boy. The cutest thing? The little alligator and the crawfish are wearing tri-color Mardi Gras hats!